The world has been overrun by Zombies! Lock and load, and defend the "Human Area" from zombies! He did not sign up for this.. He did his duty as a human and went to war, and he died, and was supposed to stay dead.. Instead he awoken as this.. this monster, in this hellish hospital. It's payback time! Use your arrow keys to move around, and use left mouse click to chainsaw all that's in your way. The zombieland cast is back.. In this exciting zombie adventure! Throw balls against the head of clown zombies in order to kill them! Don't let them touch you! Survive the apocalypse like only you can! You are an engineered man who has all the skills needed for real survival. Paired with your sword, gun and bow, it's up to you to defeat all the zombies. Choose from tons of different weapons and blast your enemies before they take you down! Kill all enemy fighters who cross your path and be sure to watch out for other dangerous threats! Also be sure to pick up the special power ups that you find. You've got a big sword for a reason: to cleave through hundreds of stick men. Defeat all the sticks that stand before you with your massive sword and show them who's boss! 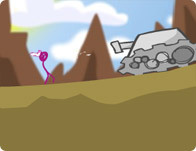 The use your stick man skills to avoid the doodle cliffs and stay ahead of the side-scrolling level. Swing fast and don't fall!